White House Press Secretary Josh Earnest (Washington Blade photo by Michael Key). Despite support expressed by Hillary Clinton and Vice President Joseph Biden over the weekend, the White House said Tuesday President Obama isn’t ready to endorse the Equality Act, although he backs the idea of federal non-discrimination protections for LGBT people. White House Press Secretary Josh Earnest said the Equality Act, which would amend existing areas of civil rights law to include gender, sexual orientation and gender identity, is still under review by the administration. 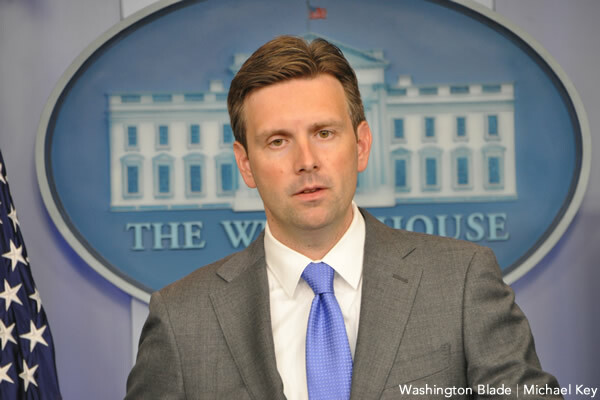 Earnest made the remarks during a routine news briefing when the Washington Blade asked if he’s ready to announce President Obama endorses the Equality Act after positive comments from Clinton, the leading Democratic presidential candidate, and Biden, who’s considering a presidential bid. Asked if the vice president was out of step with the administration when he said Congress “will pass” the Equality Act during his speech at the 19th annual Human Rights Campaign dinner on Saturday, Earnest downplayed the notion of a split between Biden and Obama on the issue. Earnest talked about the “broad impact” of the Equality Act when asked why the review is still ongoing and why the White House hasn’t yet endorsed it. The White House’s delay in endorsing the Equality Act is consistent with the hesitation seen from major non-LGBT civil rights groups on the bill. The Leadership Conference on Civil & Human Rights and the National Association for the Advancement of Colored People have to yet to endorse the bill. LCCHR and the LGBT grassroots group GetEQUAL have expressed concern about opening up the Civil Rights Act to amendments in Congress out of fear that could weaken the entire law. No Republicans are co-sponsors of the Equality Act in either the House or the Senate. Each of the 170 co-sponsors in the House and the 39 co-sponsors in the Senate are Democrats. Supporters of the Equality Act include corporations like Amazon, American Airlines, Apple, the Dow Chemical Company, Facebook, General Electric, General Mills, Google, HP, IBM, Intel, Levi Strauss & Co, Microsoft, Nike, Oracle, Orbitz, PayPal and Symantec Corp. Civil rights groups that support the Equality Act include the League of United Latin American Citizens and women’s rights groups. Earnest’s remarks are similar to what he said upon introduction of the Equality Act by Rep. David Cicilline (D-R.I.) and Sen. Jeff Merkley (D-Ore.) in July. At the time, Earnest said the White House supports the goals of the bill, but the administration is reviewing the legislation. David Stacy, the Human Rights Campaign’s director of government affairs, said the nation’s largest LGBT group welcomes the review underway within the administration. Ian Thompson, legislative director for the American Civil Liberties Union, expressed confidence Obama would come around to support the Equality Act. Mara Keisling, executive director of the National Center for Transgender Equality, said also predicted the administration would support the Equality Act. Laura Durso, director of LGBT research and communications at the Center for American Progress, took note the administration supports the goals of the Equality Act as the review is underway. The offices of Cicilline and Merkley haven’t responded to repeated requests for comment from the Blade on the Obama administration’s lack of endorsement of the bill. Why are we still taking about this. It’s a no brainier now that marriage equality is here and most Americans embrace LGBT rights…it’s time has come. This is the next big step to take before equal rights takes place in all state government. Let’s all do what we can to make sure we are fully equal by Christmas. One more thing. Every LGBT person who wants civil rights should call the White House to let the president know. The phone number is 202 456 1111 we need this Federal legislation the Equality Act passed…tell him I sent you.